High resolution audio is quickly becoming an important market driver in personal audio. Objective measurement methods have until now not kept up with this trend. This is why we have developed the new High Resolution Ear Simulator. It offers a precise method for measuring up to 20 kHz. With repeatable measurement results and a humanlike loading of the headphone it narrows the gap between objective measurements and humans with ”golden ears”. Advances in hearing aid design have made it desirable to increase the frequency range of hearing aids. This is why we have developed the High Resolution Ear Simulator. It offers a method for measuring up to 20 kHz with precision, consistency and good repeatability. The GRAS RA0402 is a high resolution version of the well-known standardized 60318-4 ear simulator which has gained wide acceptance as the preferred tool for measurements with simulation of the acoustic load presented by the human ear. Below 10 kHz, the standardized ear simulator does a good job at this. However, above 10 kHz its performance starts rapidly to deteriorate. The primary reason for this is its high Q resonance at 13.5 kHz. This resonance makes the acoustic load that the ear simulator constitutes more complex and imposes an un-linearity on the output above 10 kHz where repeatability is poor and measurements of frequency response and distortion are unreliable. The new GRAS High Resolution Ear Simulator mitigates this limitation. The steep resonance at 13.5 kHz has been replaced by a much dampened resonance and the useful frequency range is now extended to 20 kHz within a narrow tolerance band. It complies with IEC60318-4 and its acoustic transfer impedance is within the tolerance band specified by IEC60318-4. From 10 to 20 kHz the transfer impedance is within ± 2.2 dB, resulting in much improved repeatability. Also, realistic THD measurements are now possible. It is measured and calibrated according to the ITU-T Recommendation P.57 and delivered with a calibration chart specifying its sensitivity and frequency response. Its externally polarized equivalent is GRAS RA0401 Externally Polarized High Resolution Ear Simulator. Measurements below and above 10 kHz in the same test sequence - results below and above 10 kHz can be compared/analyzed in the same process. Measurements below and above 10 kHz both at ear drum reference point, i. e. with the same acoustical load. Better distortion measurements, even from as low 3-5 kHz and upwards. IEC 60318-4: Occluded-ear simulator for the measurement of earphones coupled to the ear by ear inserts. ITU-T Recommendations P.57 (08/96) Series P: Telephone transmission quality, Objective measuring apparatus: Artificial ears. The RA0402 embodies a number of carefully designed volumes connected via well-defined and precisely tuned resistive grooves. In an equivalent electrical circuit, capacitors would represent the volumes, and inductance and resistance would represent respectively air mass and air flow within the resistive groves. It is delivered with a built-in GRAS 40AO 1/2" prepolarized pressure microphone and an individual calibration chart for the ear simulator. Where the standard ear simulator has a high Q resonance at about 13.5 kHz, the high resolution version has a built-in dampening system that attenuates the volume related resonances by about 14 dB. Also the shape of the resonances has been softened. In this way, the useful frequency range of the coupler is extended to 20 kHz. The advantages of the design with resonance dampening are clearly visible when comparing the standardized RA0045 Ear Simulator and the RA0402 Ear Simulator. The transfer impedance of the High Resolution Ear Simulator with the IEC tolerance and the GRAS tolerances from 10 to 20 kHz are shown in Fig. 2. It can readily be seen that the amplitude and shape of the half-wave resonance are very different. Where the standardized ear simulator has a peak that tops above 36 dB, the RA0402 is 14 dB lower. At the same time the slopes of this resonance are more rounded in the RA0402. The overall result is a much more useful response, whose effects on measurements are much easier to identify. The RA0402 is for measurements on earphones and hearing aids coupled to the human ear by ear inserts such as tubes, ear molds, or ear tips and for measurements where the influence of the pinna and the head and torso are part of the investigation. GRAS has a large portfolio of test devices for such measurements, ranging from fairly simple table top test setups to comprehensive configurations based on the KEMAR manikin, with or without mouth simulation. If you already own one of out a table top testbeds, the RA0402 is a drop in replacement for 43AC, 43EA and 43AG already configured with RA0045. A comprehensive range of accessories for making measurements in accordance with IEC 60318-4 are available. For upgrade information, contact GRAS for further information. Advances in hearing-aid design have made it possible to increase the frequency range of hearing aids. This is the basis for a need for a method for measuring above 10 kHz, in ways that are precise, consistent and offer good repeatability. A traditional 60318-4 ear simulator has poor repeatability above 10 kHz and is ill suited for measurements on wide-band hearing aids. The High Resolution Ear Simulator meets the demand for an accurate broadband measurement method where the measurements at high frequencies can be trusted. It is within the IEC limits, so the link to historical data can be maintained and existing test procedures can still be used - full backwards compatibility is ensured. The GRAS High Resolution Ear Simulator is therefore well suited as a high resolution supplement to the standardized 60318-4 (former 60711 ) ear simulator – or as a new reference tool for hearing aids manufacturers R&D testing and design verification. Realistic test of headphones and earphones requires that they are presented with an acoustic load that simulates the human ear. The traditional 60318-4 coupler does exactly that, but testing above 10 kHz does not produce reliable and reproducible results because of the sharp and very dominant resonance at 13.5 kHz. In practice this limitation has made it necessary to measure the high frequency behavior of the transducer under test with other means, such as mounting it on a baffle and measure in the near field with a ¼” microphone. With the RA0402, it is now possible to measure below and above 10 kHz in the same measurement setup, at the drum reference point and with the same acoustical loading of the transducer under test. This makes tests of headphones much easier, with improved repeatability. RA0402 can be used as a development tool for development of insert type headphones as well as supra- and circumaural types. For R&D of headphones, the RA0402 can be mounted in a KEMAR. When furnished with the anthropometric pinna, tests of supra aural and circum-aural headphones can be done to a much higher degree of realism than previously possible. When a headphone is mounted, the anthropometric pinna collapses against the head much like the real ear, and sealing and leakage related effects can better be investigated. For insert type of headphones the better shape of the ear canal improve seal and fit, vastly improving repeatability of measurements. The combined advantage of the anthropometric pinna and the RA0402 is better test results at low frequencies and improved resolution at high frequencies and much improved repeatability. For QC purposes, the RA0402 can be mounted in a 45CA Headphone/Hearing-protector Test Fixture. The RA0402 can be used with a standard CCP preamplifier, e.g. the GRAS 26CA 1/2" Preamplifier or the GRAS 26CB 1/4" Preamplifier fitted with an adapter. For the 1/4" preamplifier, use either the straight RA0003 Adapter or the right-angled RA0001 Adapter. 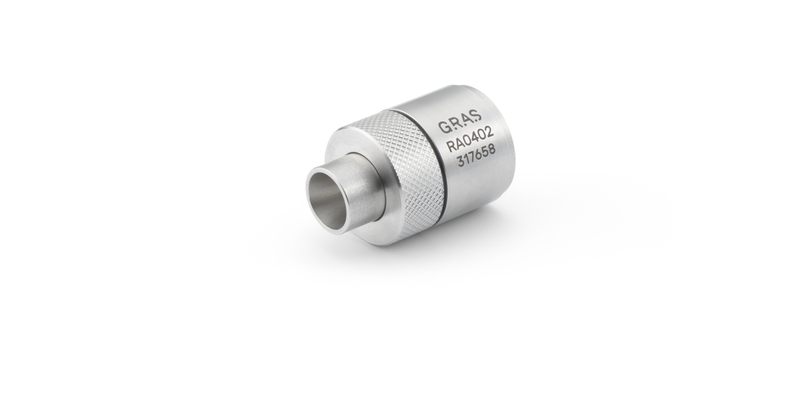 Like the RA0045 the RA0402 has a dust protection filter to prevent dust and dirt from entering the internal volume. This filter should be kept clean and replaced when needed as dust build-up will influence the performance of the coupler. GRAS Sound & Vibration reserves the right to change specifications and accessories without notice. I accept to be contacted regarding my request. I also consent to receive any updates of the data in question. We log data to send you an email with links to the documents requested and provide you with future updates of the data in question.